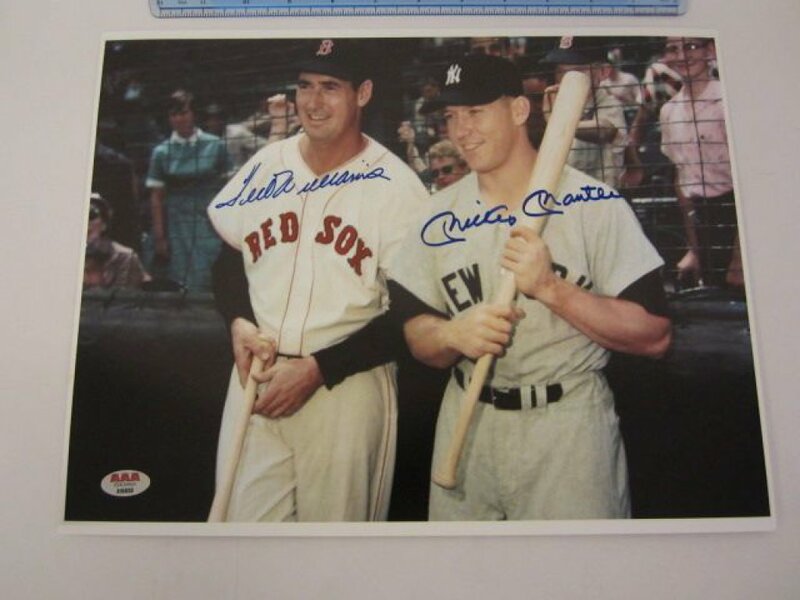 Ted Williams (Boston Red Sox) and Mickey Mantle (New York Yankees) signed autographed 11x14 photo. This hand signed item comes with a Certificate of Authenticity: Autograph Authentication Authority (AAA) #A16030 J Sugarman Auction. Corp. is please to let you know that your item has an Independent Authentication and that the accompanying Certificate (COA) enclosed with the item is proof of the items authenticity. This Certification of Authenticity does not imply that the item will be certified by any other rival authentication companies, the accompanied certification is the only certification the auction company can confirm. These are items are being sold as collectable pieces, there is no guarantee that this item can be resold on any online marketplace including eBay, Amazon, etc. Each of these companies has their own policies and politics. Payment Instructions: Your credit card will automatically be charged at the conclusion of the auction for your invoice total. The full purchase price on all lots sold to the same buyer must be paid within two business days following the conclusion of the auction, and before the removal of any items. We accept Wire Transfer, Visa and Mastercard. Shipping Instructions: BUYER IS RESPONSIBLE FOR ALL SHIPPING COSTS. ALL THE ITEMS ARE BEING SHIPPED FROM AKRON OHIO The shipping coordinator will contact you once the invoice is paid in full in order to coordinate shipping. To contact the shipping coordinator please call 234-334-4623, 234-334-4775, or email gsmsportsautos@aol.com, onlineauctions19@gmail.com If shipping has been requested, the bidder has up to 7 days from the auction date to pay for the shipping in full or it will be considered abandoned, at which point the item(s) will be disposed at the discretion of J Sugarman Auction Corp. items. Checkout Date & Times: ALL THE ITEMS ARE BEING SHIPPED FROM AKRON OHIO The shipping coordinator will contact you once the invoice is paid in full, to contact the shipping coordinator please call 234-334-4623, 234-334-4775. All payments are due at the fall of the hammer unless otherwise specified. Please be aware of this. Late payments are subject to fees and penalties at the discretion of the Auction House. Be aware that invoice delinquency WILL lead to disabling of a bidder account and making all bidding unavailable on Proxibid. All unpaid items will be subjected to a 20% re-stocking fee, in order for said bidder to continue bidding on Proxibid. Payments unpaid or late will result in the account being sent to a collections agency. This can affect your overall credit scores for up to 7 years. Your bidder registration has been researched before approval for bidding at auction. The card provided on file was verified for identity purposes prior to approval. Lastly a chargeback will be not accepted for any reason or on any purchase through Proxibid. No exceptions. All property is sold 'AS IS', and ALL SALES ARE FINAL. It is the Bidder's responsibility to determine condition, age, genuineness, value or any other determinative factor. J Sugarman Auction Corp may attempt to describe the merchandise in advertising, on the Internet and at the auction but makes no representations. In no event shall J Sugarman Auction Corp be held responsible for having made or implied any warranty of merchantability or fitness for a particular purpose. Bidder shall be the sole judge of value. Bidders who bid from off site and are not present at the live auction or preview understand and acknowledge that they may not be able to inspect an item as well as if they examined it in person. It is the Bidder's responsibility to determine condition, age, genuineness, value or any other determinative factor. J Sugarman Auction Corp shall endeavor to describe in detail each item and any pertinent information about it. J Sugarman Auction Corp will not be responsible for any errors or omissions in the description of the merchandise unless it is a material and intentional misrepresentation of the item itself. Bidder agrees that everything is sold 'AS IS' and that they may not return any item they purchase. J Sugarman Auction Corp is providing Internet bidding as a service to Bidder. Bidder acknowledges and understands that this service may or may not function correctly. Under no circumstances shall Bidder have any kind of claim against J Sugarman Auction Corp or anyone else if the Internet service fails to work correctly before or during the auction. J Sugarman Auction Corp will not be responsible for any missed bids from any source. Internet bidders who desire to make certain their bid is acknowledged should use the proxy-bidding feature and leave their maximum bid before the auction begins. J Sugarman Auction Corp reserves the right to withdraw or re-catalog items in this auction. Having an item accompanied by a COA (Certificate of Authenticity) from any authentication company does not imply that the item will be certified by any of its competitors in said field. In no event shall J Sugarman Auction Corp be held responsible for having made or implied any warranty of merchantability, ALL ITEMS ARE SOLD 'AS IS', AND ALL SALES ARE FINAL.